Sorry for the distance between my last post and this one, but I was on vacation at a national conference for work. I started with the flower in Crushed Curry, then added the outline in Delightful Dijon. Next, I added the stems with Always Artichoke (which I also used for the celebrate). The flowerless stems were created by turning the stem stamp upside down just to get the line. The dragonflies were stamped in Delightful Dijon. I then used the watercolor brush stamp in Pool Party to stamp over the wings for color. I used an aquapainter to blend the color a little and make the paper look painted. 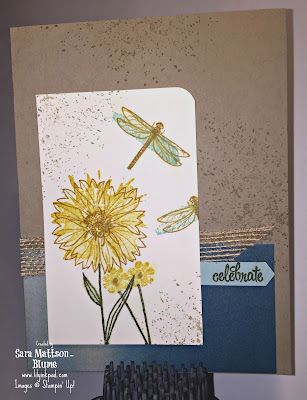 The sandy texture was from stamping Crumb Cake on the edges and background. My final touch on the stamping was Gold Wink of Stella, which doesn't photograph well, but I used it on the dragonfly body and the flower centers. That's the darkest layer, but it shines in real life. The base is Crumb Cake and I used a layer of Serene Scenery Designer Series Paper. 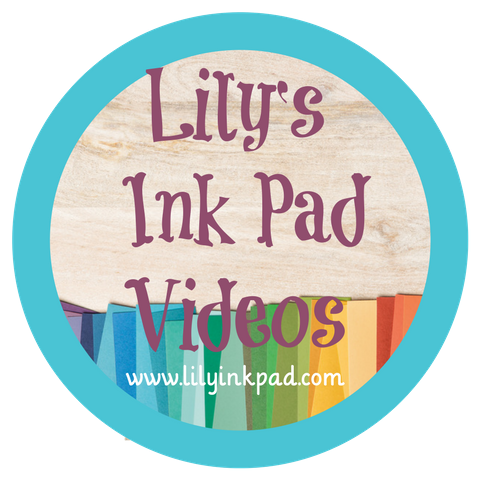 The wood wall one was the one my stamp club used, but all the ones with blue sky look great. The burlap ribbon is a perfect accent along with the Pool Party Tag punched with the Classic Label Punch. I added the corner punch with the Project Life Corner Punch because I felt the square corner was too "tough" of an edge. Is that a design term? I don't know, but I'm using it. 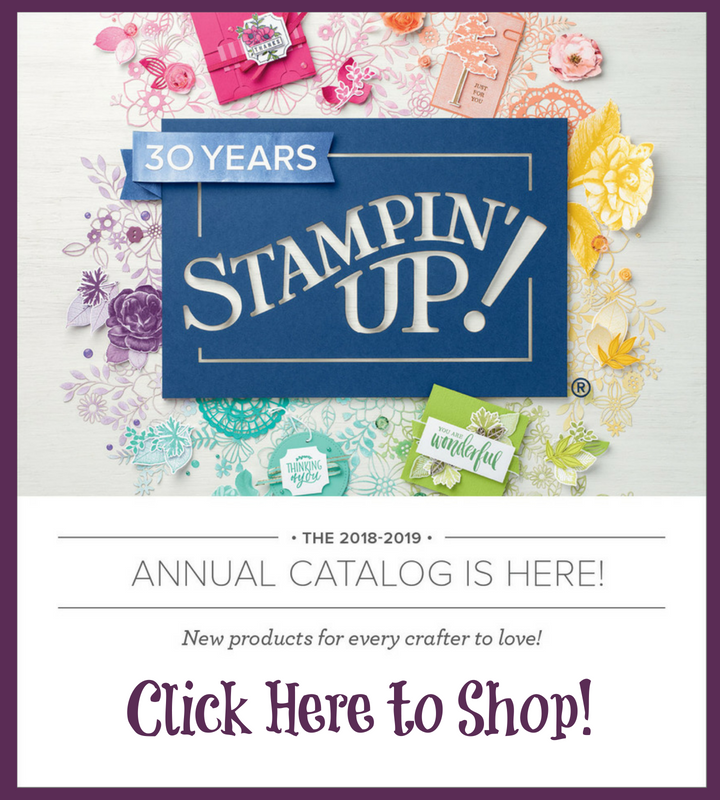 Also, there is a special right now from Stampin' Up! called Bonus Days. NOTE: Bonus Days coupon codes will be delivered via email, so an email address is required to participate in this promotion. We cannot resend emails with coupon codes, so make sure you save the email and write down the codes in a safe place so you don't miss out on the coupons you earn. 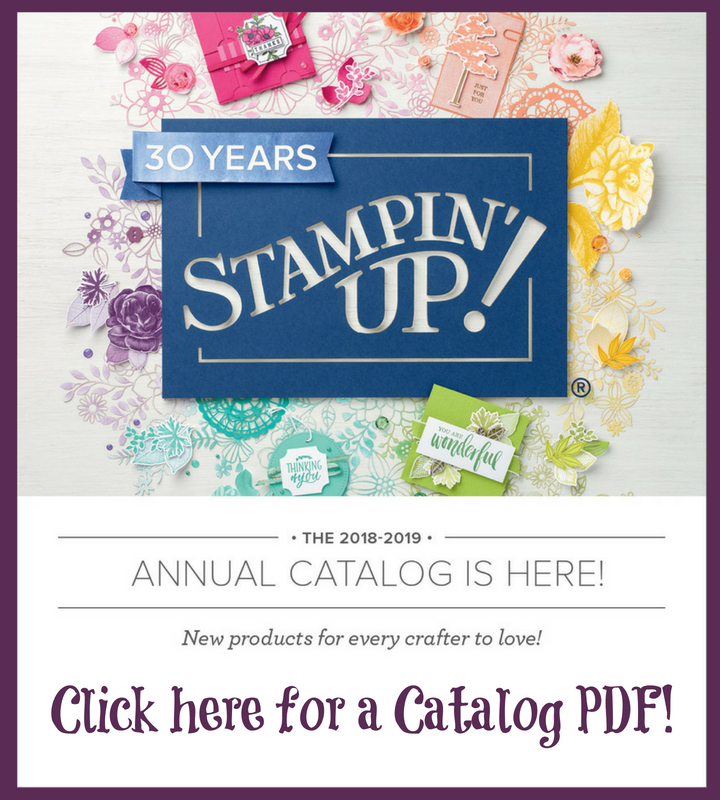 *Participants will receive a Bonus Days coupon code via email for every $50 USD/$60 CAD they spend in a single order (catalog price before shipping and tax). Bonus Days! For every $50 USD you spend* between July 7 and July 31, you’ll get a $5 USD Bonus Days coupon that you can use between August 2–31, 2016. Just go to my online store by clicking on a product below to place your order!